L.A. new romantics Roses hit the Bootleg HiFi for their November Sunday residency, presented by The Fold. The band plays every Sunday in November, with a new slate of supporting bands each night. Nov. 23 is Amoeba Music Night, featuring Hair Perfect, Crystales and Basement Babies. We’ll be on hand with coupons, buttons and more. Roses formed last year, following the dissolution of guitarist Juan Velasquez’s old band, Abe Vigoda. 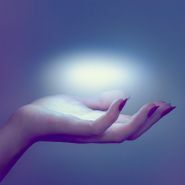 Since then, the band has played live extensively, with bands such as A Sunny Day in Glasgow and Diiv, as well as at Amoeba's Red Bull Sound Select show back in August with Tanlines, and they released the Dreamlover EP this year on Group Tightener. 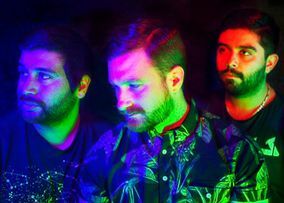 Velasquez, a veteran of Amoeba, and singer/keyboardist Marc Steinberg sat down to talk with us a bit about his new band and what they have going on into the new year. Tanlines headlined a trio of dreamy indie-pop bands for the latest Red Bull Sound Select show, which happened Aug. 20 at Sayers Club in Hollywood, curated by Amoeba. L.A. trio Roses came out bouncing around on stage with a set of new wavey tracks, about half of which could be found on their new EP, Dreamlover. After a couple of upbeat new ones, they got slow and dreamy for “The Fog” before returning to a bobbing dance beat for “Florence Girls.” Guitarist Juan Velasquez remarked that the couch-laden venue felt like MTV Unplugged, something I’d noticed upon entering (or perhaps “VH1 Storytellers”? ), and the band finished with a new song that combined Cars-style palm-muted guitars with frontman Marc Steinberg’s intoning vocals. SISU came on next, the project from Dum Dum Girls drummer Sandra Vu. In SISU, she’s on guitar and vocals, singing “stash a secret deep in you heart” like it’s a command over thumping krautrock on “Blood Tears,” the title track to her excellent album. Sometimes sultry and hazy, other times crushing with pulverizing guitars, SISU struck the right balance on songs like “Harpoons,” which pairs a grim tone and eerie effects in its verses with a sweetly sung, romantic chorus. A friend said it reminded him a bit of Adore-era Smashing Pumpkins sung by a woman, while I was thinking a lot of Curve—both great comparisons in my book! A flute by the mic was the cause of much speculation/excitement, which Vu brought out for a quick flute solo before returning to more tasty shoegaze crunch. L.A. trio Roses spin out gorgeous tunes that blur the line between dreamy introspection and new-wave pop abandon on their debut EP, Dreamlover. The band, which features ex-Abe Vigoda member Juan Velasquez on guitar with Marc Steinberg on vocals/keyboards and Victor Herrera on bass, will be at Sayers Club tonight for the next Red Bull Sound Select show, along with Tanlines and SISU, who we caught up with yesterday. The show is only $3 with an RSVP and starts at 8 p.m.; hope to see you there! We spoke with Velasquez a bit about his new band and the recently released Dreamlover before the show. You guys were friends for a while before becoming a band. Tell me a little bit about how you guys formed. Producer David Fridmann (The Flaming Lips, Mercury Rev) ends up being the perfect collaborator for Austin’s Spoon on their excellent eighth album. His unmistakable stamp helps the drums explode on rock stomper “Rent I Pay”; he augments the band’s lean indie funk-rock sound with harps and synths on the lovely “Inside Out”; and “Do You’s” loopy spaceiness helps make it the best Britpop song that never was, like late-era Blur on a country kick. Of course, none of the album’s majesty would be possible without the band itself, who co-produce (along with early producer Joe Chiccarelli) and write some of their catchiest tunes to date, and that’s saying something, given that this is the band responsible for earworms like “The Way We Get By.” The band stretches itself to the limits here without straying too far from its core appeal, as songs like the slinky, dark “Outlier” sound unlike anything in the band’s catalog but (pardon the pun) don’t stick out in a bad way. The melodies and arrangements are ace throughout, and frontman Britt Daniel becomes more versatile, engaging in a kind of beatnik singspeak on “Let Me Be Mine” while still unleashing those great, sandpapered pipes to their fullest potential on the chorus of “Do You.” It adds up to one of the best-ever releases from one of the solidest bands in indie rock, a total triumph and utterly welcome return. Spoon will be playing live at Amoeba Hollywood Wednesday Aug. 6 at 6 p.m.!